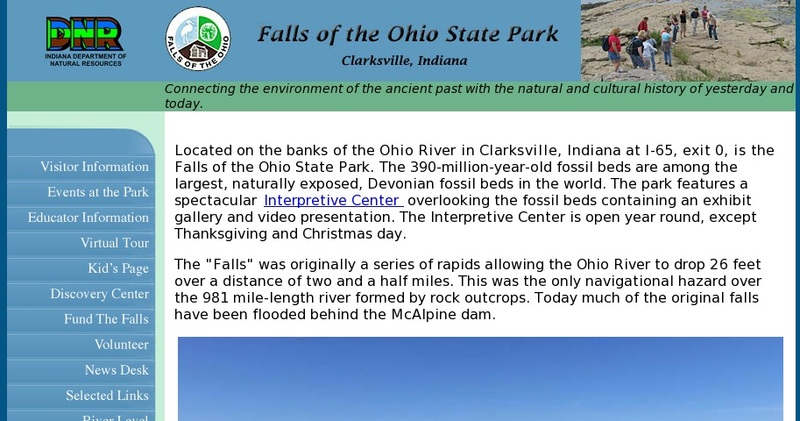 Falls of the Ohio State Park, on the banks of the Ohio river, is home to 386 million year old fossil beds, among the largest naturally exposed Devonian fossil beds in the world. The interpretive center, featuring a video presentation and exhibit gallery, overlooks the fossil beds. The Park holds a number of special events throughout the year, including fossil bed hikes, Young Paleontologist camp, summer programs for kids, geology, archeology, and paleontology workshops, and environmental education. There are several downloadable resources from the website, including illustrated information on brachiopods, crinoids, and trilobites, as well as activities to foster learning about life in the Devonian seas. In addition to the interpretive center, there are the Ohio River and Coral Reef Aquariums where visitors can view many species of fish, corals and other invertebrates. While fossil collecting is prohibited, the park staff encourages visitors to explore and discover the many different types of fossils that can be found on the ancient sea bottom.